One of the key factors in the success of any lean implementation is your people and more specifically the supervisors within the business. Why are Supervisors so important? With the ever increasing demand to do more with less, it has never been more important to maximise workforce investments. Labour costs are one of the highest expenses for most organisations, yet so many business leaders fail to see how they can get more from their human capital investments. Is it time to rethink performance reviews? Corporate Partners is a business consulting practice, we have been helping organisations around Australia to grow and evolve since 2002. We are Lean Manufacturing consultants but also utilise a variety of other proven tools to promote efficiency and eliminate waste for bottom line performance. 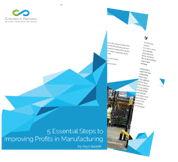 5 Essential Steps to Improving Profits in the Manufacturing Sector. The guide is packed with the information you need to drive profitability in your organisation.